Having worked in the oligonucleotide area where one often wants to snap on a label such as a fluorophore in a site-specific way, I came to appreciate the need for the “ideal reaction;” things are hard enough in this area without messy labeling methods. One step; no protecting group manipulations. Specific. No cross-reactivity at other sites, double labeling, etc. No catalyst, no additive, no external stimulus. No by-products hanging around that have to be removed. In the context of bigger molecules such as polymers and biopolymers, one also has to consider compatibility with their chemistry and synthesis. Let’s stick with oligonucleotides for the moment, though this discussion applies pretty readily to peptides. In this and the next post, we’ll consider some methods that approach this ideal. The traditional methods for labeling and bioconjugation are no fun. 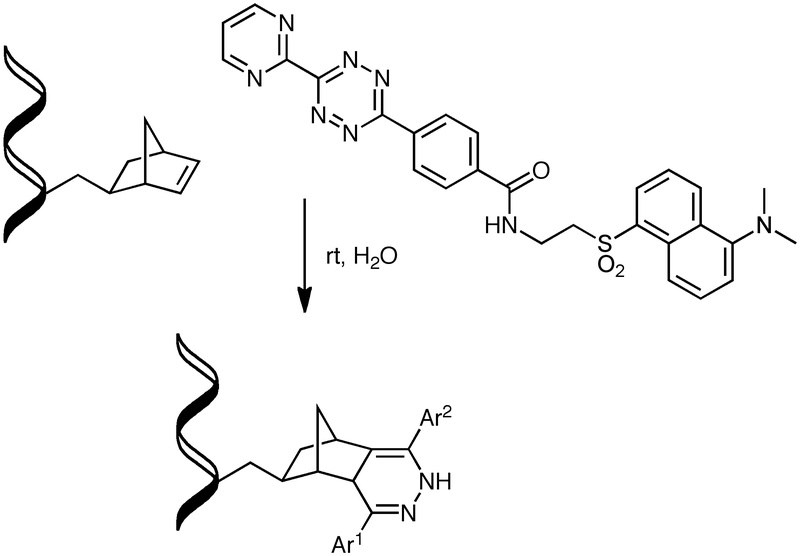 As it stands, the classic approach to oligonucleotide modification is a challenge. First, you synthesize an oligonucleotide that has a protected amine or thiol hanging off somewhere, namely from a nucleobase, the 3’-phosphate terminus, or the 5’-alcohol terminus. You then deprotect it and treat the resultant amine or thiol with the desired labeling agent, e.g., an NHS ester (for amine labeling) or a maleimide or iodoacetamide (for thiol labeling). Such reactions are quite imperfect, proceeding in modest yield and selectivity. A tedious purification is then required to remove the desired labeled material from unreacted starting material, labeling by-products, and other oligonucleotides that somehow aren’t the right ones. What a blast! The ideal reaction: What fits the bill? An attractive approach is a spontaneous reaction between the label and a handle that you’ve installed synthetically (and site-specifically) on the oligonucleotide. 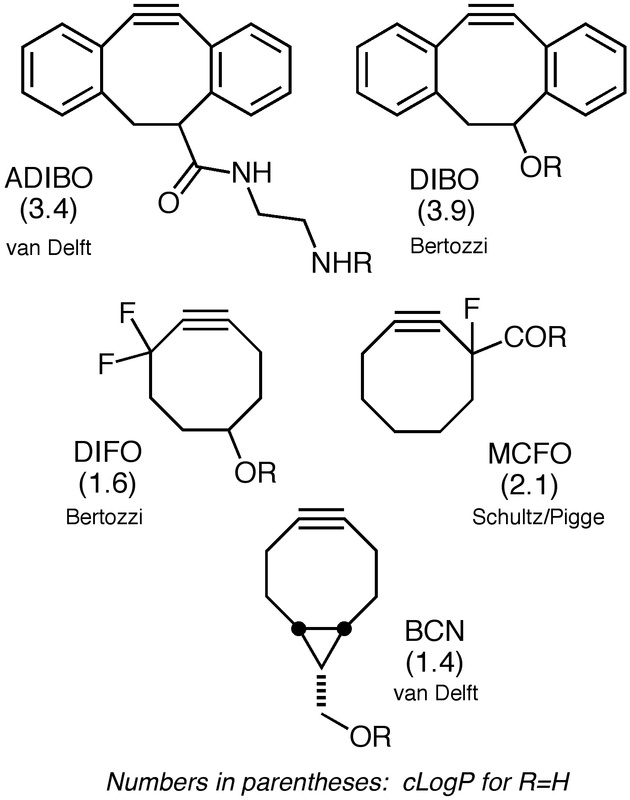 Let’s stick with the simplicity of addition reactions, recognizing that there are some other great approaches such as Bertozzi’s Staudinger ligation. To start with, you would synthesize an oligonucleotide with a handle on it so you have a chance to zero in on that site and that site only. Check. Now we need a label that bears a moiety that will recognize the handle (and only the handle) and snap onto it quickly and without any help. The term “spring-loaded” often gets used. 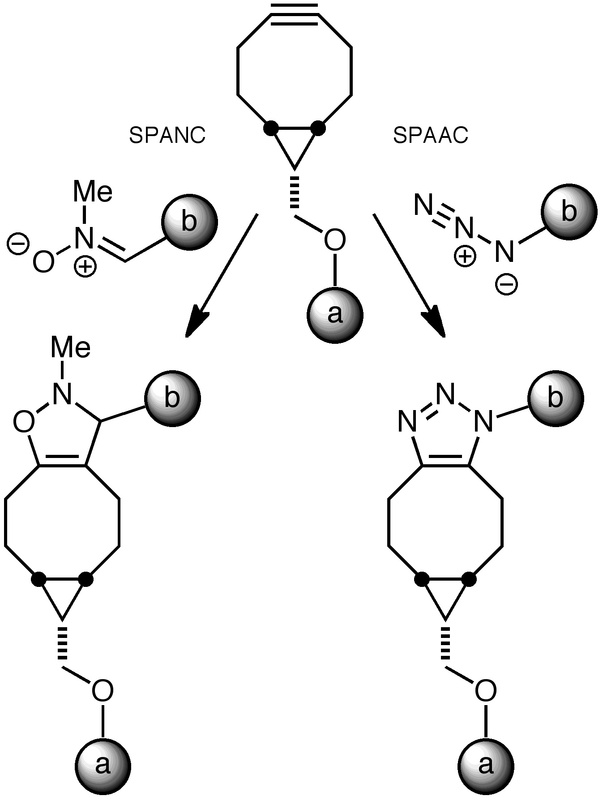 Sharpless’s concept of click chemistry readily comes to mind. The de facto standard click reaction, virtually synonymous with the term “click,” is the copper-catalyzed Huisgen 1,3-dipolar cycloaddition between azides and alkynes, an addition reaction that leaves behind a robust triazole linkage. This reaction has enabled some wonderful things in the world of biomolecule labeling and conjugation. But still, there’s that copper. Not quite ideal. We’ll hear more about this from Jack Hodges in the next post. Okay, what about metal-free click reactions? There are a growing number of copper-free azide-alkyne cycloadditions, e.g., with strained cycloalkynes (Bertozzi and others); a great idea. Again, more on that in the next post. Things are starting to look rather ideal! For those of you that need to modify biomolecules and polymers, what’s your favorite approach to the ideal reaction?